Bentley Systems announces new capabilities for the CONNECT Edition of AssetWise providing comprehensive management of road and bridge network infrastructure and all associated information including road network assets and linear events. 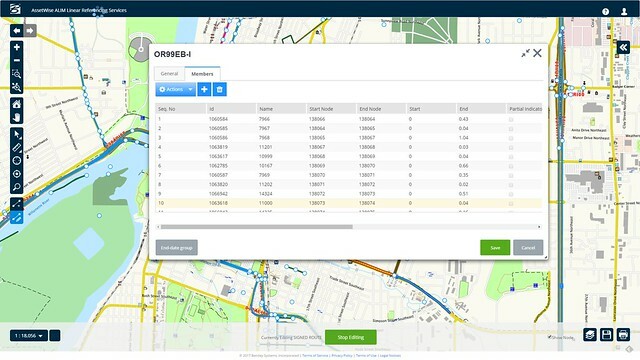 The new capabilities of AssetWise include built-in linear referencing that enable transportation agencies to locate and manage all roadway information in an integrated environment, improving data consistency and enhancing decision support. 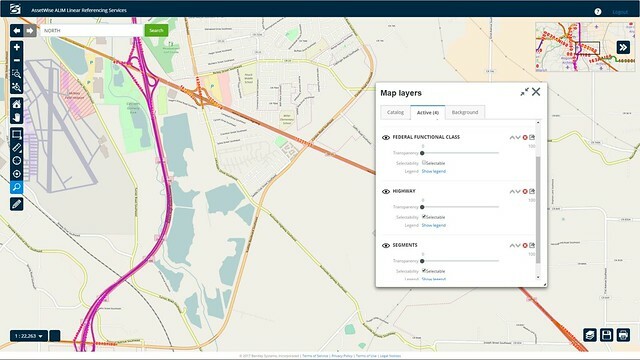 This AssetWise release enables efficient and integrated management and inspection of a full range of assets and associated attributes – from signs, guardrails, and street lighting to culverts, gantries, retaining walls, and bridges – enabling cost-effective lifecycle management of transportation assets located or associated with road and bridge networks. Inherently spatial and linear network aware, AssetWise allows users to view assets and attributes together with other spatially located information. With disciplined information management, as well as a consistent and auditable process for data integrity, transportation agencies can make smarter operational and asset management decisions that support superior asset performance. AssetWise now offers a new modern map-based Web UI that enables organizations to easily manage linear asset data for roads and bridges with logical business-based, data-driven workflows. Using AssetWise, users can quickly and effectively collect, analyze, manage, and report inspection data while working in the field or at the office. User-friendly graphical reporting provides the ability to query and report on data. AssetWise eliminates the ad hoc solutions typically required to consolidate and analyze transportation data for regulatory reporting requirements. It reduces the time and effort required to extract, assemble, and analyze data to prepare for and meet legislative or mandated reporting submissions (including HPMS, HDM4, or other regulatory reporting requirements around the world). AssetWise allows users to perform complex analysis and spatial reporting without relying on GIS or IT resources to collect, consolidate, and analyze the extent, condition, performance, and operating characteristics of the roadway or highway. AssetWise optimizes asset performance and supports an asset strategy of safety, reliability, regulatory compliance, operational efficiency, and risk mitigation. Built on a hybrid cloud-computing platform that leverages a common data environment, AssetWiseconverges and analyzes IIoT and other data sources, providing operations, maintenance, and engineering with accurate and reliable information, when it is needed, to make informed decisions, from capital planning through proactive asset maintenance. Aligned with international asset management standard ISO 55001 and BIM standard PAS 1192 (Level 3), AssetWise ensures assets are delivering optimal value and meeting business needs. AssetWise applies information modeling and information management technologies to asset operations and, when combined with Bentley’s ProjectWise, provides a complete lifecycle information management solution for owner-operators. AssetWise solutions are advancing intelligent infrastructure for owner-operators in asset-rich industries including oil, gas and chemical, transportation, electric power, and water/wastewater utilities, which have a combined net infrastructure value of over $4.5 trillion. For additional information about AssetWise, visit www.bentley.com/AssetWise.